If you've been following Morningstar's research for long, you know how important we think expense ratios are to the fund selection equation. The expense ratio is the most proven predictor of future fund returns. We find that it is a dependable predictor when we run the data. That's also what academics, fund companies, and, of course, Jack Bogle, find when they run the data. But it's been a couple of years since I provided the proof statement, so we have updated the data to show just how strong and dependable fees are as a predictor of future success. That's not to say investors should use them in isolation. There are many other things to consider, but investors should make expense ratios their first or second screen. You can see all the data in our white paper. To begin any test of predictive power, we use historical data so that we are using the data that investors would have had access to at the time. That includes funds that no longer exist. In fact, that's a key part of the story because higher-cost funds are much more likely to fail and be merged away. If you do not factor them in, you will see better performance from higher-cost funds than was the reality, as those that survived naturally are more likely to have produced better performance while so many failures have been culled. We looked at a few different measures to test how expense ratios worked: total return over the ensuing period, load-adjusted returns, standard deviation, investor returns, and subsequent Morningstar Rating. In addition, we calculated a success ratio for all the above measures. The success ratio is our way of factoring in mutual funds that were merged away or liquidated over the ensuing time period. The other figures only include data on funds that survived the whole time period. But the success ratio asks, "What percentage of funds survived and outperformed their category group?" Only funds that did both count toward the success ratio, as it is hard to argue that funds that no longer exist or underperformed were successful. For our tests, we began by grouping funds into quintiles within their peer group and then rolled that up into an asset class. That means we ordered each Morningstar Category, such as large growth, high-yield muni, and so on, into quintiles. Then we grouped all the cheapest-quintile funds in an asset class, then the second-cheapest-quintile funds, and so on. We also ran all of the above tests against a universe in which only one share class per fund was included. Some readers of past studies wondered whether fees were as strong for selecting between funds rather than among share classes of the same fund. So, to eliminate comparisons of multiple share classes of the same fund, we limited this test to the oldest share class of a fund. We looked at the five years ended December 2015, the four years ended 2015, and so on. We've done this over many years and many fund types, and expense ratios consistently show predictive power. Using expense ratios to choose funds helped in every asset class and in every quintile from 2010 to 2015. For example, in U.S. equity funds, the cheapest quintile had a total-return success rate of 62% compared with 48% for the second-cheapest quintile, then 39% for the middle quintile, 30% for the second-priciest quintile, and 20% for the priciest quintile. So, the cheaper the quintile, the better your chances. 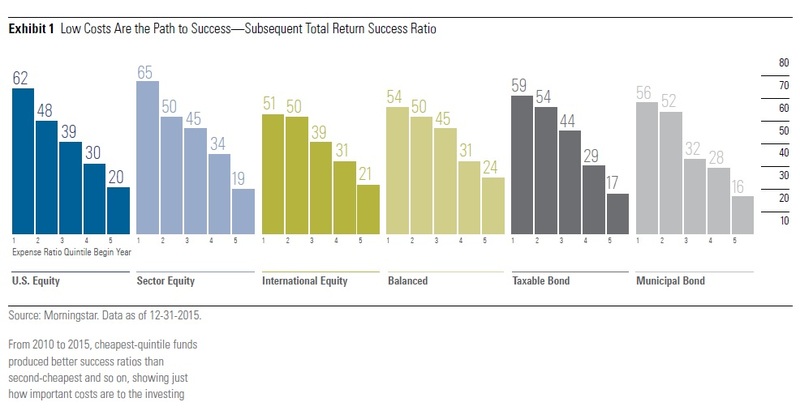 All told, cheapest-quintile funds were 3 times as likely to succeed as the priciest quintile. (If you're wondering why only one quintile had a success ratio above 50%, it's because many funds did not survive the time period. If no funds were merged away, then the overall success rates would average something close to 50%.) As it was, about 20% of the funds were merged away, making 40% the average success ratio point. The pattern was pretty similar in other asset classes. For example, international-equity funds had a 51% success ratio for the cheapest quintile compared with 21% for priciest. Balanced funds had a 54% success rate for the cheapest quintile compared with 24% for the priciest. Taxable-bond funds were even more striking, as the cheapest quintile delivered a 59% success rate versus just 17% for the priciest quintile. Muni bonds had a similar pattern, with a 56% success rate for the cheapest quintile and 16% for the priciest. The predictive power also holds up in the other areas we tested. It points investors to a better outcome for investor returns and for load-adjusted returns. That makes some sense, as both are fairly closely tied to total returns. It was a much weaker predictor of standard deviation, though that's not a big surprise, as fees and volatility are not very closely linked. For U.S. equity funds and sector funds, standard deviation was a hair lower for lower-cost funds. There wasn't much pattern for the other asset classes. Funds with high costs, especially in bonds, do tend to take greater risk in order to produce a competitive yield. However, that generally means taking on more credit risk, and credit risk damps standard deviation except when it blows up. So, what if we limit our fee test to just one share class per fund? It actually shows stronger predictive power. For example, the success rate of returns in U.S. equity funds rose to 64% with just one share class versus 62% with all of them, and the priciest quintile falls to 15% versus 20% for all share classes. This was true in most asset classes except for international equity, where the success rates became more compressed. More important than the slight improvement in results is the larger point that this clearly helps you choose among funds and that the share-class criticism of fee studies does not hold up. Now that you know expense ratios are a crucial part of fund selection, how do you find the cheap ones? On Morningstar.com, you can search for below-average fees using the Fund Screener. Also, on individual fund data pages, we describe fund expense ratios from Low to High on the Expense tab. 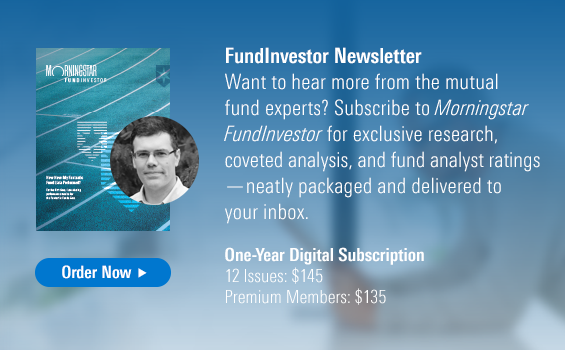 Finally, the Fund Spy selector on mfi.morningstar.com tells you whether a fund's fees are in the cheapest quintile. Just enter the fund ticker. Whose Fees Have Come Down? Let's look at which funds have seen the biggest drops in expense ratios. I will look at the biggest cuts and hikes, though I'm excluding Janus and Fidelity funds because the two firms use performance fees, which can fluctuate wildly without a shift in the base fee. Eventide Gilead (ETGLX) has gone from really pricey to just pricey. The fund charged 1.62% in 2013, 1.50% in 2014, and 1.35% in 2015. So, the fund is still expen­sive, but the trend is encouraging. Seafarer Overseas Growth and Income (SFGIX) saw a 10-basis-point fee drop to 1.30% and then added a waiver that dropped it to 1.15%. It is a young fund where expenses are falling as assets grow quickly. In this case, though, that drop is enough to take the fund into the second-cheapest quintile in emerging markets. That's pretty good for a fund with about $1 billion in assets under management. Manager Andrew Foster was formerly at Matthews funds, which generally gives investors a fair deal on price. Columbia Acorn Select (ACTWX) cut its expense ratio to 0.95% from 1.04% on an annual basis, but it is actually coming down more to 0.84%. The reason is that management is waiving 20 basis points of its fee through April 30, 2017, because of poor recent performance. We don't rate the fund. Artisan Global Equity (ARTHX) is another young and growing fund. Its fees have fallen to 1.37% from 1.46%. That's going in the right direction but still above average. Morgan Stanley Institutional Growth (MSEGX) has rising fees. Its expense ratio rose to 0.96% in 2015 from 0.83% in 2014, though that just brings it back to 2013 levels when it was 0.95%. Fees had come down after the fund merged with another, but it is not clear why they have bounced back. On the plus side, the fund still remains on the cheap side for its peer groups. Merger Fund (MERFX) saw a fee spike of 11 basis points to 1.34%. Assets under manage­ment have been fairly stable, so it is not clear why they have risen. Again, though, its fees are just 1 basis point above the cutoff for cheapest quintile. Metropolitan West Total Return Bond (MWTRX) is a surprise entry on the list. Its asset base has swelled to $72 billion as many who fled PIMCO landed at MetWest. Yet this fund's expense ratio has bounded to 0.68% from 0.62%. That's still pretty cheap but hard to justify. Finally, Greenspring's (GRSPX) expense ratio has risen 6 basis points to 0.95%. Disappointing recent returns have spurred outflows, so the fee increase is understandable. Still, fees are now merely average, thus diminishing the fund's appeal.